France starts less than 21 miles from where England ends. Standing on the White cliffs of Dover on a clear day, France looks amazingly close.... and it is. Just 35 minutes in the Channel Tunnel, or 100 minutes on a ferry, and you're in France. These are the fastest and easiest for cars, cyles and foot passengers. Both the ferry companies operating out of Dover, as well as Eurotunnel, offer cheap day return offers, specially at times when their boats and trains are not usually full. In summer 2018, P&O Ferries were offering a day return for car and passengers to Calais or Dunkirk from £45 single for a car and passengers, and come Autumn they will probably be lower. As for Eurotunnel le Shuttle their best rates for a day or two-day return was a bit more. The Shuttle is not open to pedestrians or cyclists. If the sole or main aim of the trip is to stock up on cheap wine and beer, then Calais is a great destination. Calais has all you need for a shopping spree in France. From the ferry port, it's 4 km along the road, to exit 3, where close by there is a large Carrefour supermarket, three wine superstores and a large Brico Depot, for all DIY needs. Alternatively you can head into Calais town centre, and enjoy a bit of more traditional French atmosphere. However Calais is not the most exciting nor touristy of French towns. For a more interesting day in France, a better idea is to head 35 km down the coast, on the free A16 motorway, to Boulogne, one of France's biggest fishing ports. Boulogne has the French national sea-life centre, Nausicaa, France's largest aquarium, which is very easy to find if you leave the motorway at exit 32, and head into Boulogne centre along the coast. For those with a more cultural bent, the historic centre of Boulogne is well worth a visit. Known as the Old Town or the Citadel, it is entirely enclosed within medieval ramparts built in the 13th century. Within the old town are the 12th century belfry, the 19th century basilica, and the historic castle, which houses the city's Museum and art gallery. Boulogne has plenty of restaurants, specially down by the port. 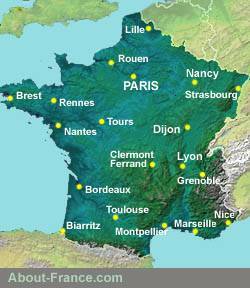 Click for best online rates for hotels in or near the following towns short trip destinations in France. see Nord - Pas-de-Calais area guide. Day trips by ferry to Dieppe, Le Havre, Caen and Cherbourg. DFDS Seaways offer a special rate - £108 return (car and passengers) in March 2018 from Newhaven to Dieppe. There is also a foot-passenger return fare of £30. Dieppe is an attractive little port, and the ferry ties up within a mile's walk of the old town. Brittany Ferries offer day trips to France from Portsmouth Poole or Plymouth from £24 for foot passengers and £78 per car until July 2018. Though these give a day in France, this does not include the overnight crossings, so this is really a two-day trip. Among the destinations offered, the most interesting is Saint Malo. The historic fortified old city can easily be visited in a day, with time to enjoy the beach too. A day trip to Caen will allow one to visit the Normandy beaches, or the Bayeux tapestry, but not both. A day trip to Roscoff from Plymouth is only for those who like long hours of night sailing and a day in a fishing village. A day in Paris or Lille from London by Eurostar requires an early start – bearing in mind that UK time is one hour behind continental time. The earliest departures from London to Paris are around 6 a.m., and the last departures from Paris about 8 pm local time - which in theory can give you up to 9 hours in Paris, which is a big day. Visit our Paris guide for more about the French capital. While a return is in theory possible from £58 per person, most day returns to Paris via Eurostar will cost at least twice that. Check out best available rates on Trainline.eu. For a full list or French airports served by low-cost carriers from the UK, see Fly to France. But before jumping at ideas, it's best to remember a few points. a) If you fly to France, you'll either be without transport when you get there, or else you'll need to use public transport or hire a car. b) If you want to fly out and back the same day, you'll need an early morning flight out, and an evening flight home. Most of the UK-France routes run by low-cost operators do not offer this possibility. Some routes do not even operate every day. Those that do operate every day may well have different times on different days, so going out on one day and returning on the next could leave you with anything between 18 hours and about 35 hours in France, depending on schedules. The only destinations for which a day return trip is possible are large cities, such as Paris (check out Paris on a tight budget) , or Lyon, Nice or Bordeaux - and then not every day. c) Many airports are some distance from their city centre; so allowing time to get back to the airport, and for checkin, time in the destination city may be very limited. About-France.com's recommendation : in all but a very few cases, flying to France for the day will not be worth the effort and cost. Far better take a two-day trip, when at least you can enjoy an evening and a night in France. Check out Fly to France. to see who flies where. Rather than just a day trip, check out the best options for a long weekend in France. The ferry operators and airlines offer short break deals too, and with a couple of nights in France, or a night in France and a second night on the ferry, the time in France will be less stressful; you'll have time to relax and enjoy a good meal or two, enjoy an evening, and have time to visit a site or a museum, or lie on the beach. Texts and photos © copyright About-France.com except where otherwise indicated.